Guwahati, Apr 9 : The traditional Assamese gamocha is making headlines - at home and abroad. In the presence of Assam chief minister Tarun Gogoi, the Assamese gamocha was given an international recognition on Monday under the category of "the world's longest hand-woven feat of silk" in New Delhi. Measuring at mammoth 1455.3 metres, the feat was accomplished by Abhijeet Baruah in the national capital and was recognized by the Guinness World Records. Baruah broke the previous record held by one J Mammato from Indonesia. The silk gamocha had imprints of different historical and heritage symbols of Assam like the Rang Ghar, Majuli, Sankardeva, Bhupen Hazarika and the one-horn rhino. "It was my idea on which I have worked for the last six months. The main purpose of this was to showcase the Assamese gamocha in front of the world and to tell people that we have more to show and represent. Ten people were involved in making the gamocha and the entire thing weighs around 138 kg," said Baruah. Baruah, who already has 11 different world records, now has two Guinness records with this feat. "With the recent Sualkuchi incident, it is now required to protect indigenous items and give them the respect. I want to offer my thanks to Kaziranga University, Joon Hazarika, Sumnagal Dutta and Manna Dey for their help," said Baruah. The gamocha was put on display at the India Gate lawns. Union DoNER minister Paban Singh Ghatowar and other dignitaries were present. As it was rolled out, the gamocha left everyone spellbound. Baruah was given a certificate by Fortuna Burke, an official of the Guinness World Records. Gogoi was so impressed that he announced incentives for Baruah and the workers. With Bihu around the corner, it was a perfect gift for Assam and its people. It may be mentioned that cheap polyester-made gamochas are giving a tough fight to the traditional hand-woven ones these days. 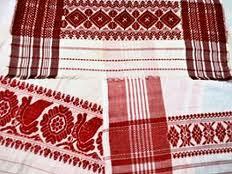 Though the shopkeepers say the sale of traditional gamochas are satisfactory ahead of Bihu, the polyester-made gamochas are surely a threat to the weavers as they are being sold as cotton gamochas in many places.